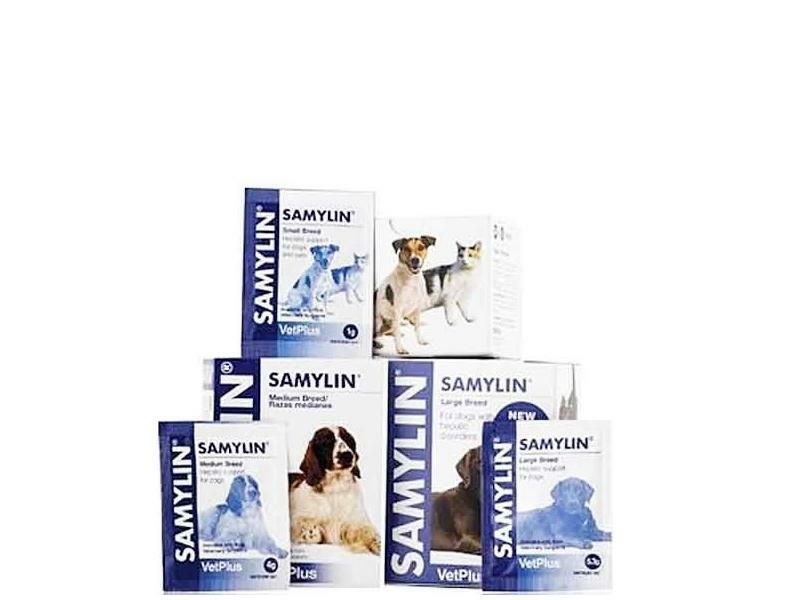 Samylin is a food supplement used where there are concerns regarding liver function. Samylin contains SAMe which is a precursor of glutathione. This is known to be required by the liver and elevated levels are able to increase the effective functioning of the liver. Other ingredients include the antioxidant and thiol donor Silybin (found in Milk Thistle), Vitamin E and Vitamin C. Samylin is used at a rate of one sachet per 5kg of bodyweight per day, mixed with food. Below are some recent questions we've received regarding Samylin Liver Supplement for Dogs, including answers from our team. Yes it is fine to crush the tablet and give it in food. Samylin is also available in powder form which might be easier the next time you buy it. If you accidentally order the wrong product, you can return it to us (at your own expense). It it arrives back to us and you have taken appropriate care with the product, we will be happy to refund your full purchase price. 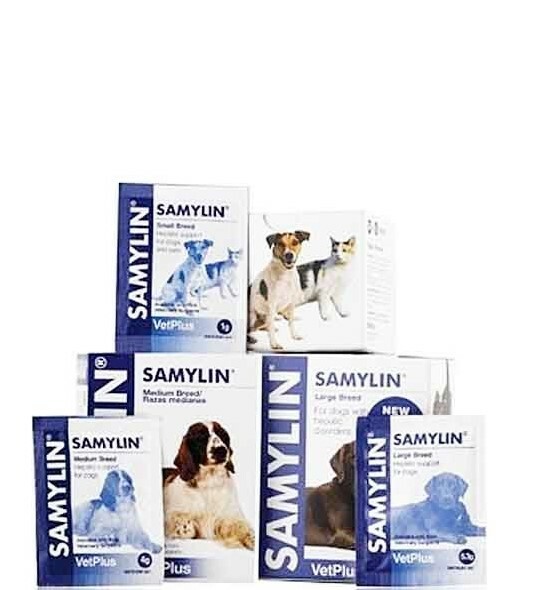 Samylin is marketed just for dogs by the manufacturer and so we have to follow this lead and advise that it is intended just for dogs. However all the active ingredients are sometimes used in cats and the main ingredient is indeed regarded as helpful and very safe for cats with liver trouble. If you choose to use it in a cat this is up to you, but I think it would be safe. hi, doc, i bot samylin for years and always mixed with food and other supplements like fish oil, probiotic and vitamin c. my dog has been ok and didnt have any stomach upset. i am wondering if this way of feeding is ok and any restriction when feeding samylin. thank you!! 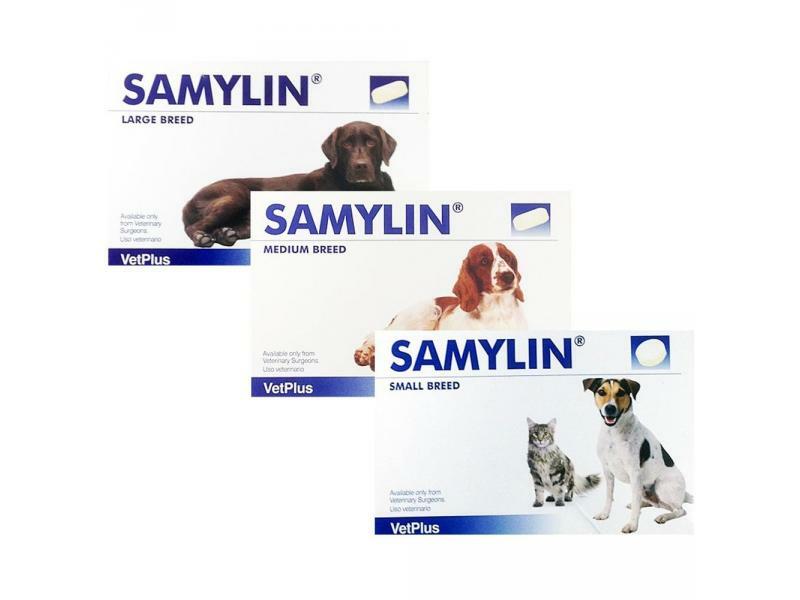 Samylin is usually given with food and it can certainly be given with the other supplements you mention. I do not see any problem with you doing this. There are some supplements which can potentially cause trouble in themselves, particularly those containing vitamins A or D. Overdosing those can cause trouble. As long as you avoid that and you generally only give supplements in the quantities recommended by the manufacturer, it should be safe. You might not need to be giving so many supplements; most dogs do not need them if the general diet is good quality. However this is up to you. Obviously check with your own vet if you are unsure about anything, or about your dogs medical conditions generally. Pill or with Guggum whether powder? get it a pill !!! Would like to know if we may. please understand !!! Thank you. You can give tablet or powder. You can split the tablets. better. We ask, please! "please"
Samylin is regarded as one of the best liver supplements and it is likely to be as good as any supplement of this type. Some liver conditions can respond to antibiotics or steroids or other prescription medication, so your own vet can advise you on these. Ideally you need to make a precise diagnosis and then treat that condition as well as you can. Raised liver enzyme levels usually indicates liver damage, but tells you nothing about why that damage has occurred. This should be investigated. Sometimes it can be caused by a bad reaction to other medication which has been given, so if your dog is on any other medication which could be causing the damage, you should consider stopping that immediately. This product is normally taken with food. The tablets can be given whole or crushed, but some food is normally given at the same time or afterwards. The powder is much better given with some food. If the vet has recommended you stop giving this to your dog then that's fine. Otherwise the dog would just not be getting any liver support. What is the difference between small and medium breed?Is it only capacity of difference or there are other differences or ingredients? The difference is purely in the amount of ingredients per sachet, they are the same otherwise. Right dosage for a heavy cat. My cat weighs seven kilos and his ALT has been so high. We have been giving him two packs of samylin for months. Should we be giving him ONE or TWO? It is safe to give 2 sachets for such a large cat, but I would be tempted to give just one sachet daily from now on. I would also suggest that if your cat is overweight (it certainly sounds like it must be) then very gradual weight loss would be very helpful too. Fat builds up in the liver and is not a good thing.